Smartphones with biometrics, like facial recognition, are becoming the norm. But not everyone is running out to get the latest device that uses this type of technology—even if it does help protect their privacy. In fact, a January 2018 survey of US internet users by global facial recognition platform FaceFirst found that consumers are split on the technology. 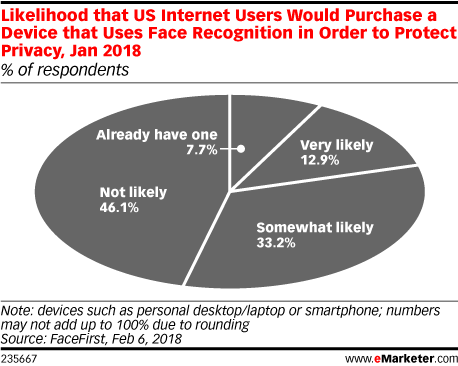 Some 46.1% of respondents said they were not likely to purchase a device with facial recognition to help protect their privacy, while 46.1% said they were at least somewhat likely to buy one. FaceFirst's findings are in line with September 2017 data from Morning Consult, which also found that US internet users are somewhat split when it comes to mobile devices with facial recognition capability. Roughly a third (34%) of respondents had a favorable outlook of the technology, while 39% did not. Many consumers are likely not running out to buy a device with biometrics because such devices are pricey. Indeed, Apple's iPhone X is the manufacturer's most expensive device to date. And spending that much money on a device that opens your phone by recognizing your face—as opposed to a fingerprint or pass code—may not be reason enough for many people. 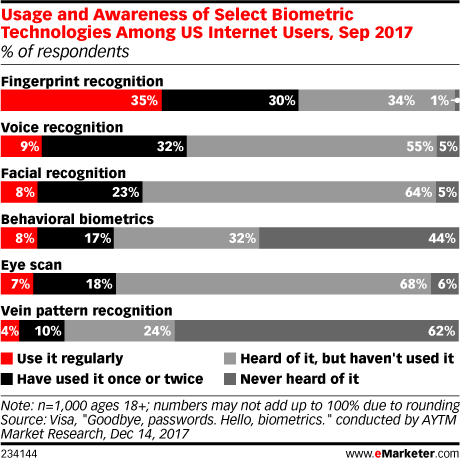 According to September 2017 survey of US internet users by AYTM Market Research for Visa, fingerprint recognition is the most commonly used and known biometric technology among respondents. In fact, 35% of internet users polled said they used it regularly. Facial recognition was used by less than 10% of respondents, though a large share (64%) were aware of the technology.